DJ Khaled appeared on Jimmy Kimmel Live! to discuss, among other things, some new details of his upcoming tenth studio album, Grateful, out this summer. Khaled has previously announced that his four-month old son Asahd is the Executive Producer, and went into new details about his role in that capacity. When Asahd can't make it to the studio, his father finds other ways to keep him involved. 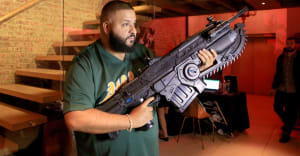 Khaled revealed that, while waiting on vocals from Big Sean, he used a video of his son to apply pressure. He announced that Drake will be featured on the album as well, and recalled the Toronto rapper giving him and Asahd a gift of custom matching, interlocked diamond keys when he was born, presumably as a token of appreciation for the baby's forthcoming musical input.